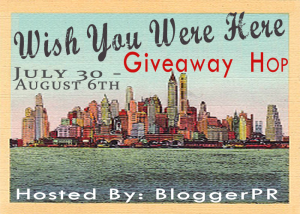 This week 4,500 bloggers, including myself, will be heading to New York City for a huge blogging conference and several of us got together to hold this Wish You Were Here giveaway hop while we’re gone! This event is hosted by BloggerPR and will run from July 30-August 6, 2012. Each giveaway prize is valued over $25.00, so you are bound to find something you love! Good luck and have fun! As a Carmex Blog Squad member I’m always super excited to get to try their new products and to let my readers know about them. They have some terrific lip balm flavors to choose from, but I think they’re really outdone themselves with their new Pomegranate sticks. Carmex sticks are super moisturing, they have SPF 15 and they’re water resistant so your sun protection will last longer. They’re available in six flavors – original, cherry, strawberry, vanilla, lime twist and the new sweet, yet slightly tart pomegranate. 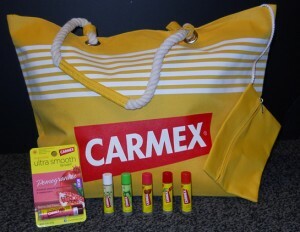 One lucky reader is going to win this awesome Carmex beach bag plus all six flavors of Carmex sticks! 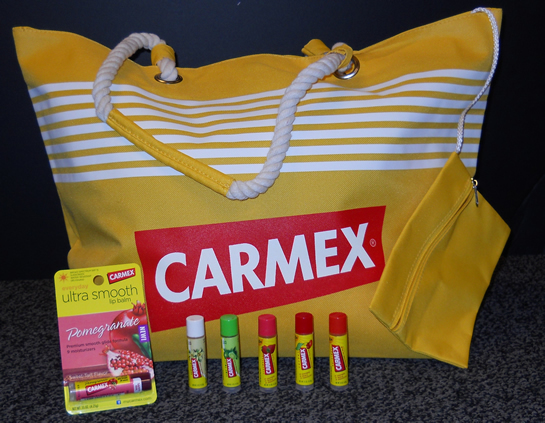 Enter to win the Carmex Beach Kit in the Rafflecopter widget below. This giveaway ends at midnight on Monday August 6th. 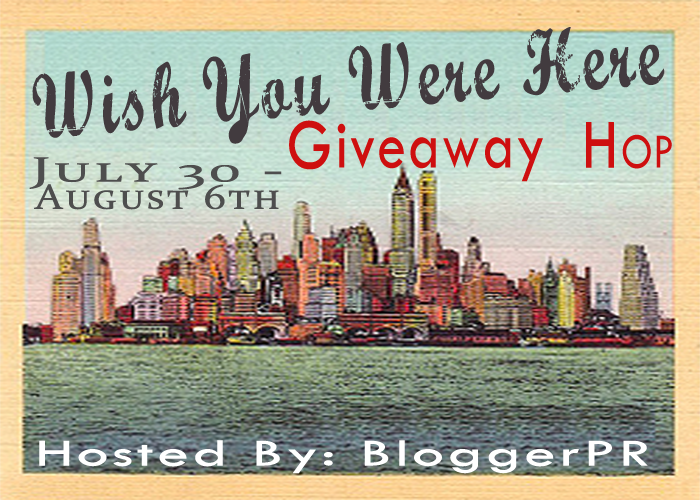 Don’t forget to click the links below to enter as many of the other amazing Wish You Were Here giveaways as you would like! I highly recommend bookmarking this page so you can spread out your entries over a few days. Good luck! Disclosure – I am a member of the Carmex Blog Squad and I was provided with a prize package to giveaway as well as one for myself for the purpose of facilitating this review. I have received no other compensation and all thoughts and comments are my own. ShopperStrategy.com or the Wish You Were Here bloggers are not responsible for sponsors that do not fulfill their prizes. During the fall and winter when we start running the heat in the house and going outside less my skin starts to get really dry. That’s why I’m such a big fan of Carmex Healing Cream and Healing Lotion. The healing cream is concentrated to use on your driest skin areas and the healing lotion is great for daily use to soothe and protect dry skin. My favorite part is that even though they’re both rich and creamy, they’re not greasy and they have a light pleasant scent. New Carmex Coupon & Chance to Win! Here’s a hot new $1.50 off Carmex coupon that you should hurry over to print before they run out! 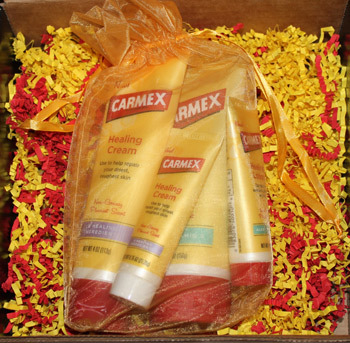 While you’re at it you might want to ‘like’ Carmex on Facebook and enter for a chance to win their Carmex Healing Lotion and Carmex Healing Cream Giveaway. I’m a huge fan of the healing cream because its thick and seals in the moisture without being greasy like other creams I’ve tried! I printed two of the coupons and I’m planning to hang onto them until the next deal at my fave Walgreens. Carmex Picnic Package Giveaway Winner! Thanks so much to all who entered our giveaway for a Carmex Picnic Package that includes 1 Carmex Lime Twist click stick, 1 Carmex Vanilla click stick, 1 Picnic blanket, and 1 Carmex Moisture Plus satin gloss finish! The winner is . . . . .
As a member of the Carmex Blog Squad I recently had the opportunity to try out the new Carmex Lime Twist and Vanilla click sticks and I just have to say – the only thing better than the regular Carmex is having new flavors to choose from! I thought that the Vanilla would be my favorite because I’m already a fan and I like light and natural flavors, but the Lime Twist is also fabulous. It has a nice light fruity flavor and I love it too! I’m thrilled to be able to giveaway a Carmex picnic package that includes 1 Carmex Lime Twist click stick, 1 Carmex Vanilla click stick, 1 Picnic blanket, and 1 Carmex Moisture Plus satin gloss finish! How to enter – 6 different ways! Tell us what new Carmex flavor you’d like to try first. Leave a comment below then click “I did it” in the Rafflecopter widget. The winner will be chosen at random at midnight CST on Friday August 20th. Click ‘more’ below to see the giveaway widget! Carmex Lip Balm Giveaway Ends Tonight! 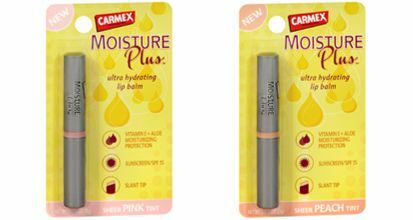 Reminder – the Carmex Moisture Plus Tinted Lip Balm Giveaway ends tonight! Head over to the original giveaway post to enter. 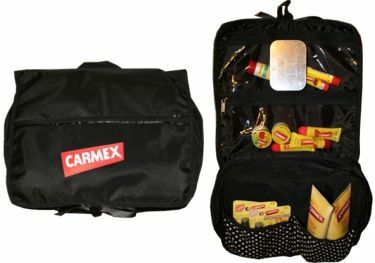 Carmex Product Line Giveaway Winner! Thanks so much to all who entered! We have another giveaway coming up that I’m hoping to have posted before the day is over 🙂 Please come back and enter that one as well! 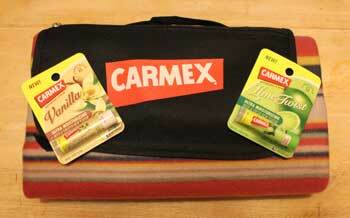 Giving away great stuff like this Carmex prize pack is one of my favorite things to do. Just a reminder that the Carmex giveaway for this awesome assortment of lip balms and lotions ends at midnight CST tonight. Head on over to the giveway post and enter for a chance to win!